Aerotrek A220 flying home to Florida, July 2015 . . .
Aerotrek A220 flying in California . . .
Aerotrek A220 "flying over San Francisco" . . .
Aerotrek A220 "San Francisco Bay Tour" . . .
Aerotrek A220 "Over the Golden Gate Bridge" . . .
Bill's Aerotrek A220 at Crazy Creek . . .
Aerotrek A220 in North Carolina, "at DBW International" . . .
Aerotrek A220 in North Carolina, "This Flight's For Parker" . . .
Aerotrek A220 in North Carolina, "Five NC Grass Strips" . . .
Aerotrek A220 in North Carolina, "Ten Thousand Feet" . 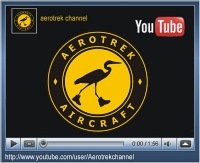 . .
Aerotrek A220 in North Carolina, "Flight To & From Oak Island" . . .
Aerotrek A220 in Pennsylvania, at "Rookie Field" home airstrip . . .
Aerotrek A220 in Pennsylvania, landing at Sunbury Seaplane Base . . .
Aerotrek A220 flying in Baja, Mexico . . .
backcountry flying with buddies with classic older taildraggers . . .